Beautiful, that is the right description for the place called Biloxi in Mississippi. I thought that having to live here would be hard. We came from Orlando, Florida but, knowing the piece of history, I began to love this place. I know that this place suffered from hurricane Katrina (2005) and hurricane Camille (1969) but, I truly admire how the people here came in unity and stand up to build this place once again. What I am showing you here is the KATRINA SCULPTURES. I took these pictures because they are unique, creative and a masterpiece. It was in January 2007, Mayor A.J. Holloway and city Public Affairs Manager Vincent Creel spoke with Mississippi “chainsaw artist” Dayton Scoggins about sculpting marine-related figures from the standing dead trees in the median of Beach Boulevard in Biloxi. 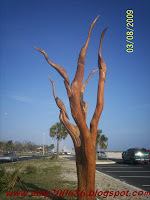 The trees were damaged by the saltwater storm surge of Hurricane Katrina last August 9, 2005. Scoggins created egrets, seagulls, pelicans and dolphins from a collection of dead trees just west of the Biloxi Lighthouse. Scoggins's initial five sculptures are worth $7,000 investment for the city. 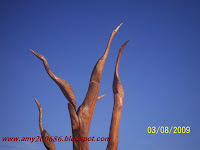 A sculptor and frequent Biloxi visitor from Fort Walton Beach, Florida named Marlin Miller was inspired to approach the city about donating his time and talent to sculpting more standing dead trees in the center medians in Biloxi. And knowing that very admirable offer, "HE IS A PATRIOT". Rarely you would see people extending their talent, skills and time for FREE. So, MARLIN MILLER, you are a Patriot and I salute you for that. Miller's represent the majority of the 20 works of art in Biloxi . Let it be known that during his multiple sculpting visits, he has refused any reimbursement or payment for his public works of art. Thumbs Up, right? A visitor survey by the Gulf Coast Convention and Visitors Bureau reported that the sculptures are one of the top attractions in the Mississippi Coast. 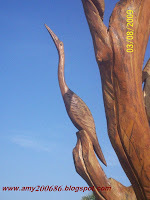 And I am one of them that admires the beautiful Katrina Sculptures in Biloxi.